School of Biotechnology and Bioinformatics, D.Y.Patil Deemed to be University, Plot no. 50, Sector 15, CBD Belapur, Navi Mumbai, Maharashtra, INDIA. Introduction: In the current study, methanol and aqueous extracts of leaf of Cerbera odollam Gaertn were screened for its antibacterial, antifungal, phytochemicals and antioxidant activities. Phytochemical constituents were investigated both qualitatively and quantitatively. Methods: The leaf extracts of Cerbera odollam Gaertn were prepared by drying and extracted using Soxhlet apparatus into methanol and aqueous media, which were subjected to phytochemical screening. Total phenols, tannins, flavanols, alkaloids and its antioxidant activity were determined using spectroscopic techniques. Antimicrobial activity were determined using well diffusion method. Results: Aqueous extract exhibits higher content of phenols, tannins, flavanols and alkaloids, whereas methanol extract exhibits higher content of anthocyanin and cardiac glycoside respectively. Aqueous extract exhibits higher inhibitory concentration (IC %) value for DPPH (2, 2-Diphenyl-1-picrylhydrazyl) and H2O2 radical scavenging assay and reducing power (RP) assay. The methanol extracts exhibited higher inhibitory concentration (IC %) value in SO and NO radical scavenging assay, exhibiting antioxidant properties in five antioxidant models that were investigated. The methanol extract showed some antibacterial activity against Bacillus subtilis, Staphylococcus aureus, Salmonella typhi and Escherichia coli with inhibitory zone ranging from 2 mm to 3 mm, whereas the aqueous extract showed no activity. 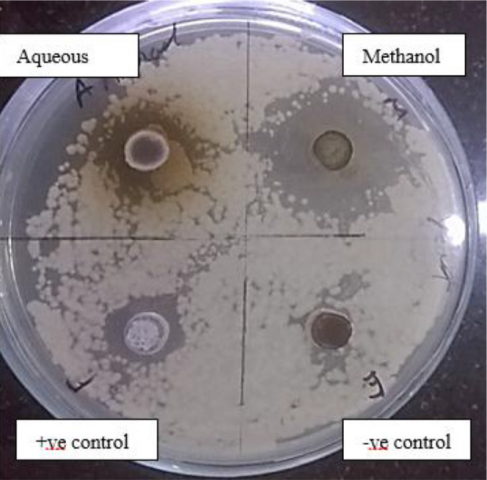 High antifungal activity was found against Saccharomyces cerevisiae and Candida albicans for methanol extract and moderate for aqueous extract with inhibitory zone ranging from 9mm to 26 mm. Conclusion: The finding of our study have suggested that the extracts of Cerbera odollam Gaertn, possesses a significant amount of phytochemicals and exhibits antioxidant and antifungal activities. zone of inhibition for the different extracts, against Saccharomyces cerevisiae. Sahoo A, Marar T. Phytochemical Analysis, Antioxidant Assay and Antimicrobial Activity in Leaf Extracts of Cerbera odollam Gaertn. Pharmacognosy Journal. 2018;10(2):285-292.